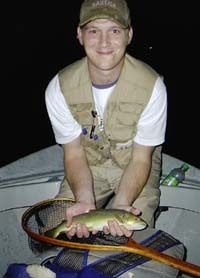 As is normally the case - few fish were rising the other day on Penns - even though the bugs were quite numerous. The grannoms are probably about over, but it does not mean the fish will still not be looking for them. Next up are the Hendricksons, and these should be in full swing very soon. Now is the time to stay on the water late and keep an eye out for the spinners. 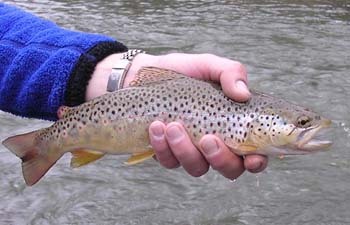 By far the best way to get into consistant action is to nymph the pocket water and the deeper runs. 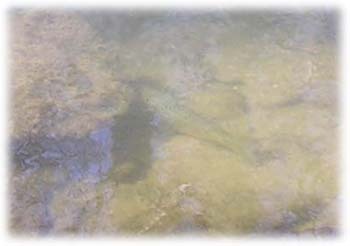 Even on sunny days the fish may still feed in these more well protected areas. Don't forget to check out our Penns Weekend Package. It is taking place this weekend - and we still have a few spots available. 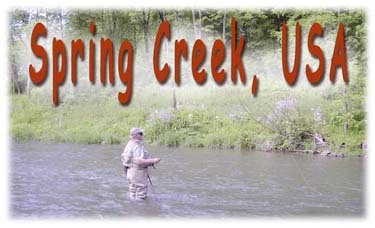 Streamside accommodations, meals and complete hands-on guiding!!! Attached are a few pics from this past week. Penns Creek in the Catch and Release section got stocked with 17,000 fingerlings two years ago. 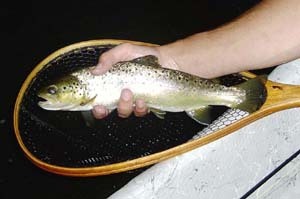 We did not turn up too many of these, but the wild trout - like the above and larger - are quite numerous. This beauty was taking grannoms just a few feet off the bank - it went about 15" or so. 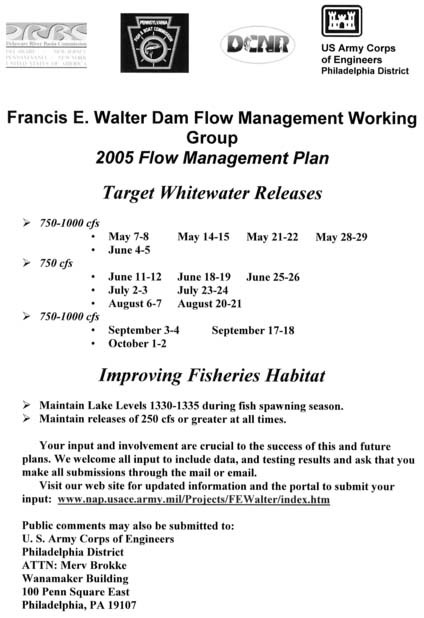 Right now Francis E Walter is on the 'fill' as called for by the 2005 Plan. The 250cfs release is the result. See if you can get out with these flows. Bugs to keep an eye out for are - little black stones - 14-20; Quill Gordons 14; Blue Quils; Hendricksons - 14. Look for water temps in the 50s, then dropping into the 40s this weekend with the colder weather moving in. On Penns look for hendrickson and the grannoms. 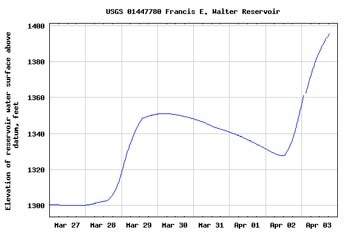 Flows are low, but with rain on the way - look for an increase. The numbers of fish in this stream should be really impressive. We look with great anticipation the planned shocking in June by the PFBC as well as the numbers of fin clipped stockies we catch and their size. The chart above shows FEW on the rise. On about April 16 the slow was cut back to about 250cfs. 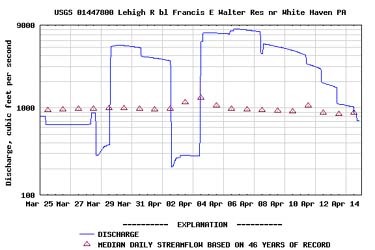 For the folks on the Lehigh this weekend - look for artificially low flows. The Army Corps has managed to release all the water from the event that gave the 1955 flood a run for its money. FEW is currently standing at about 1297' - three feet below its 'conservation pool' level of 1300'. Beginning next week the 2005 Plan calls for the lake to begin filling to 1300-1335'. Look for ACE to start skimming water this weekend since inflow will be more than the outflow. Click here for the release schedule. Look for little black stoneflies - especially so on bright afternoons. 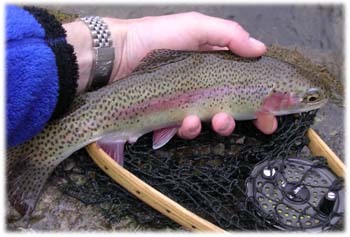 With these flows some fish may be looking up in the slower water. Good luck on OPENING DAY 2005!!! The step down releases pictured above are a result of the highest ever flood storage event. The lake reached 1407' in elevation. 20,000cfs at the White Haven gage. 1,407' equals 16.36bg or 46% of Flood Storage. The lake at this elevation is approx. 157' deep atthe bottom gate. The Crane Flys are about. Look for these insects to be skimming across the surface at high speeds. At times they can drive the trout crazy! When the Cranes are hatching the trout are looking up..
With no rain in the forcast and seasonable temps - opening day should be a goodie!!! Let the hatches begin!!!!! 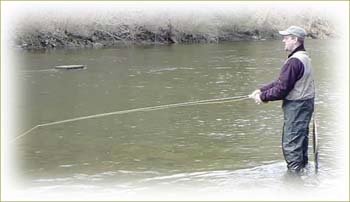 The Army Corps has just released a revised 'target' flow schedule for this spring/summer/fall. Please check out the chart below for a complete breakdown by weekend. Once again we must realize the targets are just that...Mother Nature will be the final call. 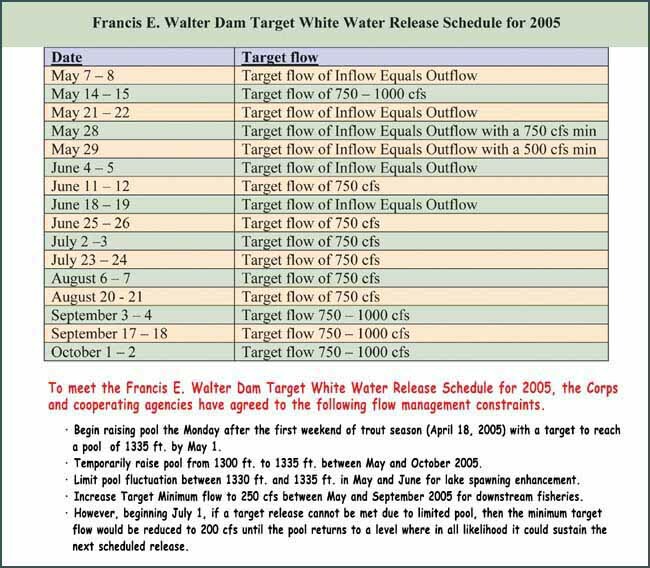 Please note weekend targets ranging from 750-1000cfs in May and June have decreased with this plan. For the original plan - click here. A work related trip to western PA provided just enough of a window of time to hit Falling Springs. It has been years since the last time on this piece of historic water and it is just as I remember....beautiful bows and all! Water temp was 52 and flows were on the high side, but clear. I did not notice any bugs at all and there were no rising fish to be found. I was really hoping to see an olive hatch, but that never materialized...so having said that, subsurface flies were gonna have to be the ticket. And they were!! It was a great day on the water and I did not see another angler! Hit it up if you have a chance. A small Falling Springs rainbow. Beauty!! 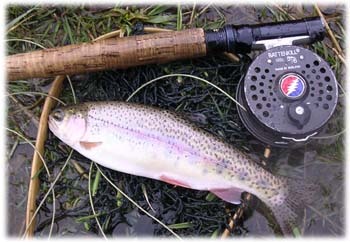 A nice size rainbow which ate a nitro. MORE RAIN! 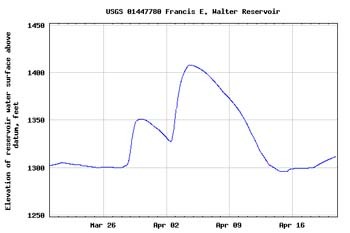 Francis E Walter is on the rise. It will most likely top-out at about the level it went to after IVAN. What happens with rain events like this is - FEW acts like a catch basin for runoff from the Pocono Plateau. The Army Corps will close the valve - during the event they went to about a 230cfs release, but with a mounting head pressure - release has risen to about 300cf as of writing. They will keep this release until levels subside enough in the lower Lehigh and the lower Delaware to warrent a higher release...then watch out! Look for a greatly increased release. It is worth noting that at 1,400' in elevation - FEW still has 60% of flood capacity available. At the peak of runoff - 20,000cfs+ was being dumped into FEW. 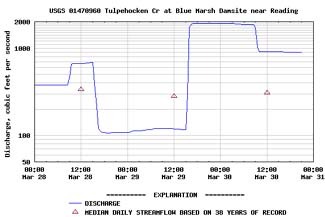 Add this water to the Walnutport Gage - and flows would have been 50,000cfs+...flood stage in Walnutport is approx 17,500cfs. OUCH!!! To follow the height of FEW - go here. 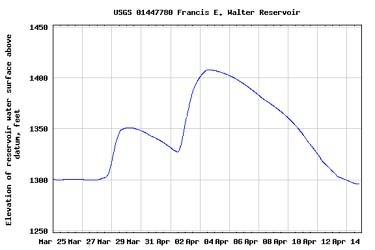 The chart above shows the climbing FEW lake pool elevation. Obviously smaller waters will run off relatively quick, but there is a huge amount of water in the ground so they are gonna stay high, clear, and cold. You can forget about the larger waters for the immediate future. We kicked off the fishing season on Tuesday with Ted who came in from Chicago to visit his in-laws. As part of the deal with the "Mrs." - Ted was permitted to fish one afternoon. Things didn't look good for Ted to get some time on the water as a result of mother nature dumping 2.5" + of rain on us Monday. Everything was high and off color. The only saving grace was that the Army Corps would have to begin holding water back from Blue Marsh Lake for flood control. Tuesday rolled around and the Corps was only releasing 120cfs from the dam. This made the Tully above Rebers Bridge very fishable, actually it was a bit low - crazy!! Ted decided he wanted to get out and give it a shot. We started at the water works area and worked some nymphs in the runs and deep pools. Nothing produced here, so after a few hours we moved down to Rebers Bridge and worked the water above Plum Creek - because below it the Tully chocolate milk! After a bit of time working a good run, Ted hooked up with what we thought was a nice brown. Turned out to be a 14" sucker. The fish really gave Ted a good fight before coming to the net. Other than that, it was a very slow day. Ted got to stretch his legs a bit and see some different water that is not common in the mid-west. In addition, he learned a few different nymphing techniques and refined his casting technique, so I guess the day wasn't a total loss. Ted working a run in the water works area. Check out the low water!! The window slammed shut at about 3pm! 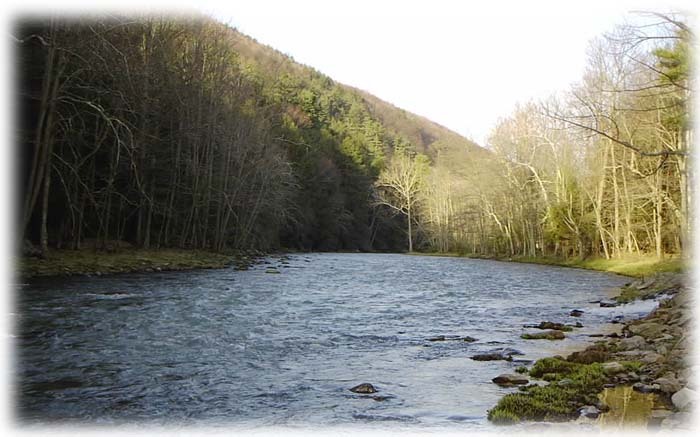 On April 26 we will be giving a presentation on the Lehigh River. Yeah, you'll see a few pics of fish, and the scenery and the bugs - but what we will really dig into are the issues surrounding the river. We will touch on it all! Topics will be: flows, whitewater, 1,450', stratification, Ivan, ACOE, by-pass valves, cold water, tributaries, AMD, and what you can do to make the Lehigh better! Don't know what all of the above means? Come and learn. Get involved! QUOTE FROM DRBC DOCUMENT: "Changes in F.E. 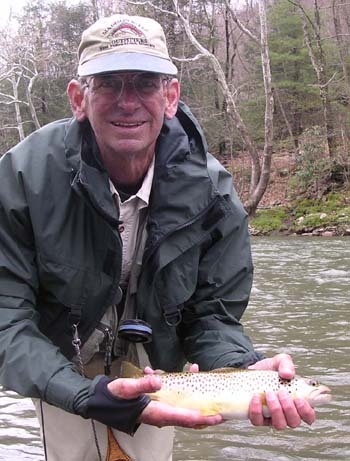 Walter operating policies could provide flow augmentation benefits for whitewater rafting, establishment of a naturally reproducing trout fishery, and other purposes." Be sure to check out our Lehigh River Evening float trips. With everyone's schedule being jammed packed just about 24/7...these trips will maximize your time on the river...putting you into the fish when they are most active. For any questions - shoot us an email. Hopefully by now all of us have gotten a good jump on that list of flies-to-tie. If you are like me, there are always those new must have patterns, but most of the time is spent wrapping the old stand-bys. Pictured here is one of those standbys... A go-to pattern for us! 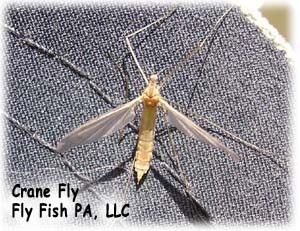 It has been recently added to our Fly Patterns Page - check it out!! 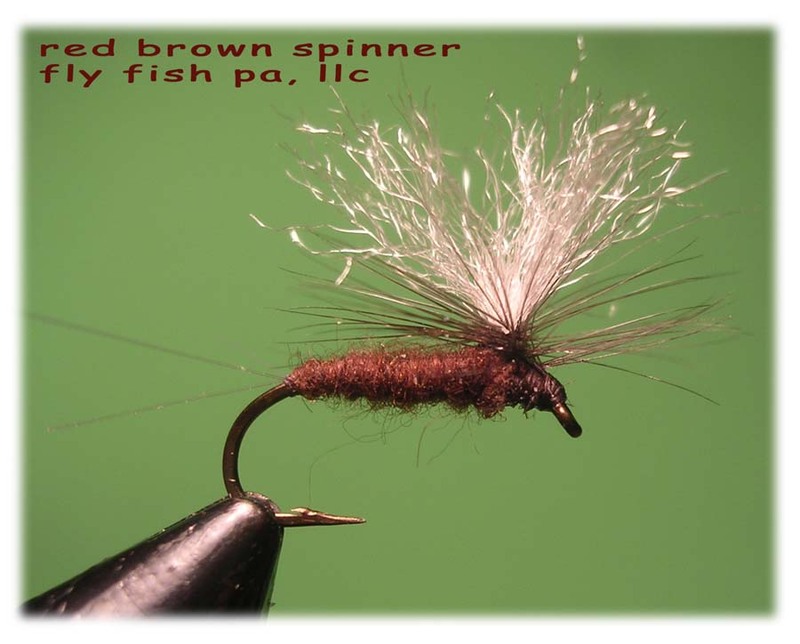 We feel this is a must have fly when fishing just about any stream in PA. Use this as a dropper from either a dry or nymph or as the lead fly in a dropper rig. Very effective..